Mon-AM: 2:06, 4500' ~ Flatiron Trifecta+Green Mt. Ended up being pretty tired, so after hitting the first three Flatirons I just slogged to the top of Green instead of scrambling the last two as well. Tired legs. Appt at Peak Performance Acupuncture in the afternoon. Up Kieners down Cables with Joe. Really good outing. Got to Chasm Lake in 1:14 and the entry to Broadway at 1:48 or so. Waited for Joe at the ledge before the first crux even though we both felt really comfortable today, like we could've soloed it. 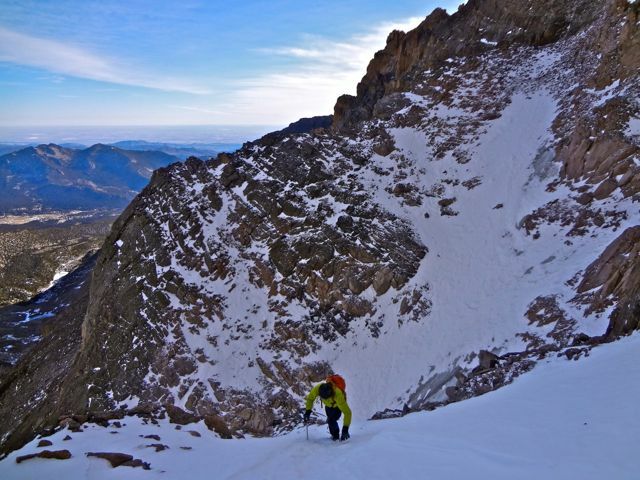 Roped up and I led as we simul-climbed across Broadway and up the Crux Cracks before packing the rope and marching up to the Diamond Step and the summit. Really nice kicked-in steps in the upper snowfield, made things easy. Got to the summit at 4:12 where we didn't spend too much time before rappeling the North Face and then running back down to the trailhead via the Jim Grove trail. Lots of wind between treeline and Chasm on the way up and then on the Boulderfield on the way down; otherwise, a perfect day. Wed-AM: 2:05, 4500' ~ Odd Flatiron Trifecta+Green Mt. 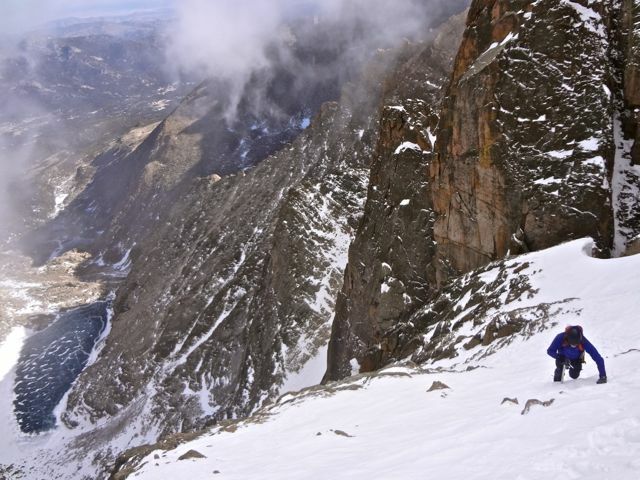 Starting from Chautauqua, scrambled the 1st, 3rd, and 5th Flatirons before heading up to the summit of Green. 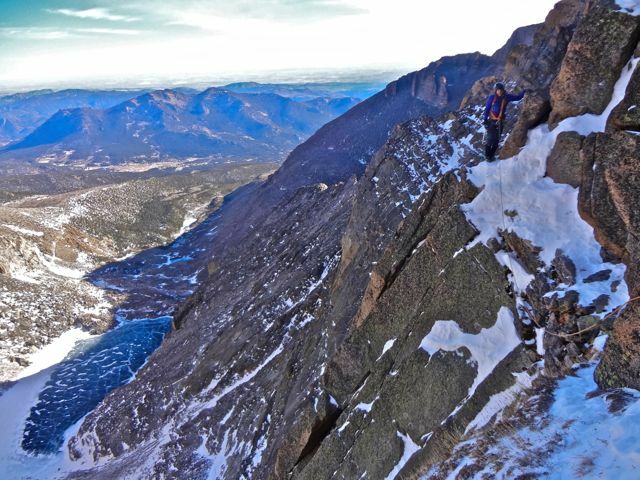 This is a really nice two hour outing because it links up the best Flatirons with the most sustained and quality climbing, and the off-trail connections between each of these flatirons are really logical. Tired legs after yesterday's long effort. PM: Climbing, w/ Joe. 4th Elephant Buttress in Boulder Canyon, Northwest Face. Thu-AM: 2:01, 4500' ~ Odd Flatiron Trifecta+Green Mt. Same exact run/scramble as yesterday, except that I had a lot more energy. Would've done the full Quinfecta, but wanted to be a little rested for another run up Longs tomorrow. Acupuncture afterwards. PM: Climbing, w/ Joe. Dome in Boulder Canyon. East of the Sun and East Slab. 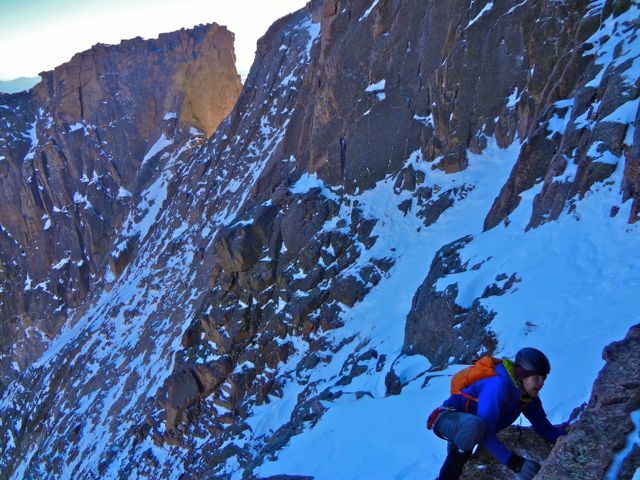 By the time we climbed the East Slab the sun was down and the moon was high. Up Kieners, down Cables. With Joe. Not too windy, but kind of a chilly day with misty clouds blowing across the upper reaches of the mountain. Simul-climbed Broadway and the Crux Cracks again, but we're getting it quite dialed in, so it goes really quickly. The snow on upper Kieners was, unfortunately, a bit drifted so that our kicked steps from Tuesday were pretty much gone, which made this section much harder work. 3:37 to the summit and a 1:19 descent. Sat-AM: 2:04, 4500' ~ Odd Flatiron Trifecta+Green Mt. Nice warm morning, but I was moving slowly on the talus with tired legs and an ankle I rolled on yesterday's descent. Felt good on the scrambles, though. Sun-AM: 2:01, 3000' ~ 3rd Flatiron+Green Mt. Easy run from my doorstep. Thought the rock was going to be wet after the rain (!) last night, but it was drying quickly in the rising sun and I didn't have any issues, even without sticky rubber. Descended Ranger to Gregory. Good to test the hip with some more sustained running, but it is still tight/twingy. 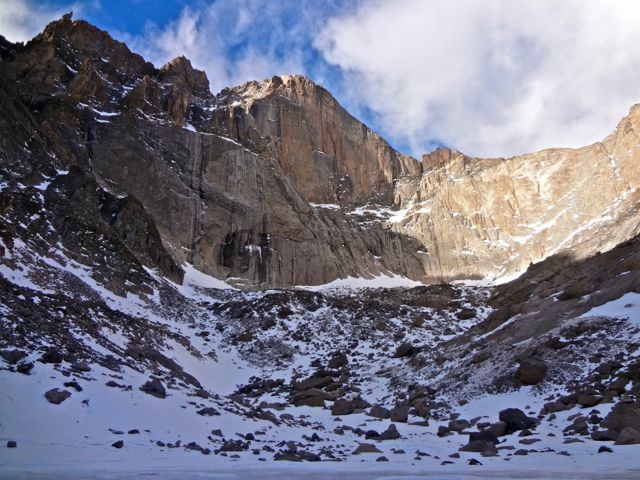 Similar to when I did the Kieners Route on Longs Peak for the first time this past summer, it's been hard to stay away from it this past week after notching my first winter ascent. It's just such a nice line on the mountain that is technical and exposed enough to keep things interesting but not too scary or difficult. So, three trips up Longs in eight days. In between I've been getting in as much scrambling as possible, trying to maximize this warm January weather and take things a little easier on my hip flexor. In the coming weeks I'll probably branch out to a couple other 14ers (but Longs is so close and so much fun! ), and hopefully start incorporating more sustained running into the routine as the hip allows. Gotta start preparing for the flat profile of the Tarawera 100K at some point with longer continuous runs, but I need to be mindful of whether my legs will hold up to that. Joe (the tiny speck) at the bottom of Lambs Slide. Joe on the entry to Broadway. Upper Lambs Slide behind. Broadway and the Lower East Face. Photo: Joe Grant. 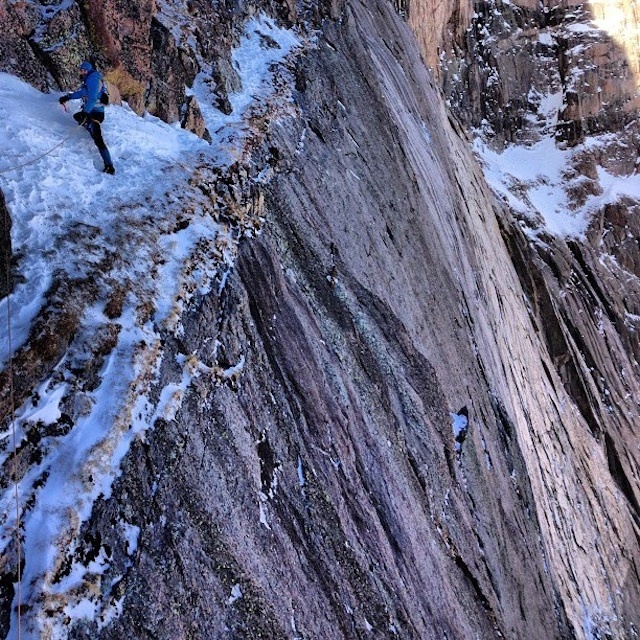 Joe just above the crux of the Broadway traverse. Joe on upper Kieners after the Crux Cracks. 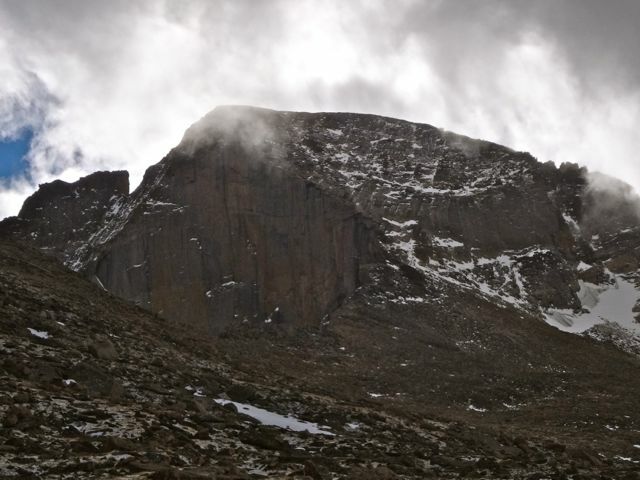 North Face of Longs (Cables route is just to the right of the Diamond). Tue-AM: 1:12, 2600 ~ Green Mt. Went up and down 1st Access from Chautauqua. Wow, running up and down mountains is hard. But the hip was 100%. Wed-AM: 1:54, 3000 ~ 2nd Flatiron+Green Mt. Oy, this run kinda wrecked me. Ran from my doorstep, ~18min to Chat, then bumbled my way up the hill. Wouldn't have made it up the 2nd (Freeway route) without Microspikes, so was pleased I brought those. Bonked hard about half-way down the hill and it was about all I could do to stumble home. Reeaaally not fit right now, but a good place to be in January. Up Kieners, down Cables with Joe. Fantastic day on the mountain. Next time we can definitely simul-climb, which should cut almost an hour off the car-to-car time. 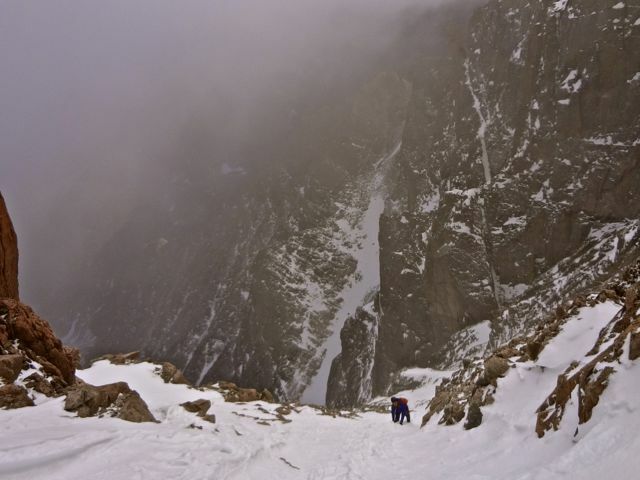 My first 14er of the year, first calendar winter ascent of Longs (though both my October and November outings were in "winter conditions" I would say), and a January grid slot for Longs. Highly satisfying outing; I was reminded of why I did Kieners seven times this past summer. Fri-AM: 1:13, 2800' ~ 2nd Flatiron+Green Mt. A little tired and sore from yesterday, so deliberately took it easy today. Flatirons look basically dry enough to scramble but I was wearing a pair of shoes with screws in them, so was forced into staying on only the 2nd Flatiron, which is moderate enough to be climbed without much friction. Another crazy warm day. Sat-AM: 2:58, 5700' ~ Flatiron Quinfecta+Green Mt. Damn, the Quinfecta is just the best. It's been a month since I've been able to get any scrambling in, so I decided that depending on conditions today I was going for all five Flatirons. Things got off to a tenuous start on the First as a couple of key holds had ice and snow on them, but I just improvised and took it easy. The base of the Second required a much more difficult start than usual in order to avoid the snow and ice, but again, no issues. The Third was the driest rock of the day. 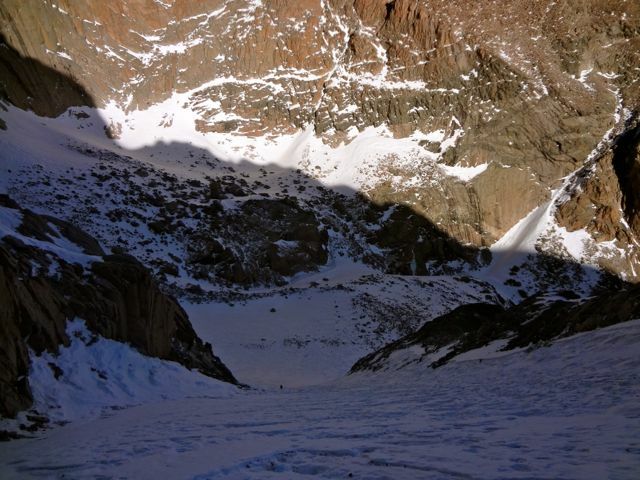 After overcoming the snow at the base of the Fifth it was dry enough, but descending its south side required hip-deep postholing in the shade. In running shorts. Ouch. The Fourth was probably the most sustainedly tricky with the whole Birthing Canal section on the second piece being completely full of snow, not to mention that by this point I was bonking like a champ (I forgot to bring a gel or two) and was desperately sucking on snowballs. I gamely trudged to the top of Green, but was able to regain some energy on the downhill. Slowest time I've ever posted on this link-up (barring the first scouting mission), but it was easily the trickiest conditions I've done it in and me at my worst fitness. Temps probably hit +60F today. A week ago, the highs were in the single digits. Gotta love the Front Range. Sun-AM: 2:10, 3000' ~ 3rd Flatiron+Green Mt. Quite tired today, so just tried to take it easy. Yesterday took it out of me. Well, 2013 had a bit of an inauspicious start for me. While visiting my parents in Nebraska over Christmas I developed a bit of tendonitis in my right hip flexor (damn runnable terrain!) and it's taken me until this past week to finally come right...but now--after some really helpful trigger-point therapy at Peak Performance Acupuncture and some excruciating body work from Jeff Staron--all is finally right with the world again. Or at least moving in the right direction. I still have to manage it, but at least I can get out in the mountains again. Boulder is getting it's annual spate of unseasonably awesome January weather right now, so I've been getting back on the Flatirons for some scrambling and am looking forward to start making regular trips up to Longs Peak, too. Joe and I got back up there again yesterday (Tuesday, 1/22) for another lap on Kieners, so things are going well on that front. Main priority right now, though, will be to get my hip 100% healthy and keep it (and the rest of my body) that way. 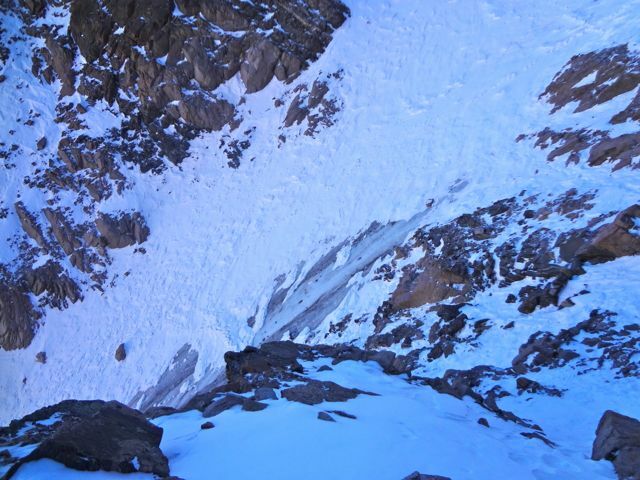 Lambs Slide at the entrance to Broadway right now on Longs Peak. A lot of exposed water ice. Colorado is very dry. 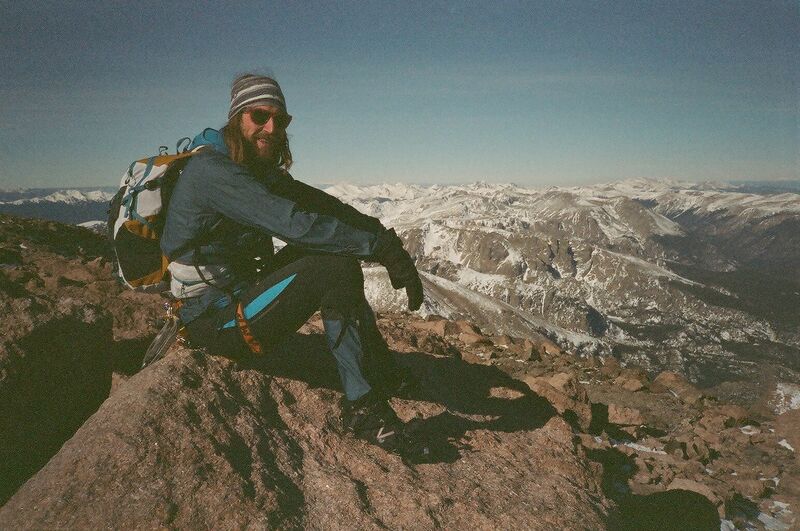 Joe on upper Kieners on Longs Peak. The Notch in the background.